A: Yes, although additional fees may apply for areas farther out, depending on zip code/delivery area. A: No. The bounce house should be clean when you get it. Look At Us Bounce! cleans and disinfects after every rental. A: Yes. A blower keeps air in the jump unit the entire time. Once unplugged they deflate. That's why we require an outlet within 50 feet of the unit or a generator. Longer cords can pop your circuit breaker so we bring our own heavy duty cords. A: We currently are set up for residential deliveries as well as parks. 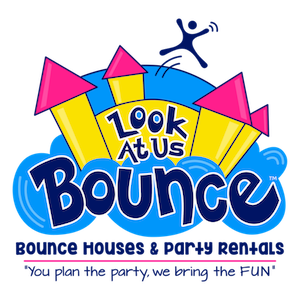 However park set up requires a generator that Look At Us Bounce does not provide. A: If you cancel 48 hours prior to your event, then full refund will be given. If it is less than that, we can offer you a rain check on the bouncer and event. Cancellations on day of party will result in loss of deposit and payment. Please call office at 623-302-2491 if further questions or concerns. A: Yes all orders require a 20% Credit Card deposit to hold the rental for that date/time. The deposit is fully refundable if you cancel your order at least 5 days prior to your rental date. If you cancel between 2-4 days prior to your rental you will be given a raincheck that is good for 1 year. A: A few of our jumps for example are 15x15 which is a little bigger than many companies rent. Please note the space required for each jump (listed near the large picture) as some are VERY big and require extra space. When in doubt, measure your space to make sure it will fit. Jumps need room to be staked and they need room for the blower and can't rub against walls or trees as this may damage the jump. The sizes listed with each jump include the space needed for stakes etc. If you have stairs or a tiered backyard, please call our office to discuss options for setup. A: Check the requirements listed with each jump. Also, make sure you have at least a 4 foot access to the area where it will be set up. The jumps can weigh up to 650 pounds so we need a clear path with ample room. A: We can set up on Grass (our favorite and best for the kids), dirt, asphalt, and concrete( note that hard surfaces require tarps and sandbags extra setup charge ). We can set up on gravel and small rocks but extra fees will apply. A: Yes and no. You are not responsible for normal wear and tear on our units. Seams may develop tears in high traffic areas over a period of time. If this happens please alert us at once so we can be aware of the situation. If however, damage occurs due to failure to follow our safety rules or negligence (i.e. not turning off the blower in high winds) you will be responsible for all damages up to and including replacement of the unit/blower etc which can cost thousands of dollars. We don't want you or us to be in that situation which is why we have you sign and initial on all of our safety rules so that you can be the trained operator.